MINNEAPOLIS, MN—Emphasizing that a proper haircut should never lacerate a patron’s head, the CEO of Supercuts expressed remorse Friday while issuing a formal apology for the number of customers they scalp every month. “I want to personally acknowledge that even a single scalping is one too many for a Supercuts Hair Salon,” said CEO Steve Price, adding that while barbers are bound to accidentally shear the skin off a client’s head here and there, the dozens of scalping incidents a week do not reflect the company’s standards. “Unfortunately, the low prices you’ve come to enjoy mean that sometimes your stylist’s scissors or straight razor might slip and end up removing several layers of flesh below the hair follicle—and we are deeply sorry for that. 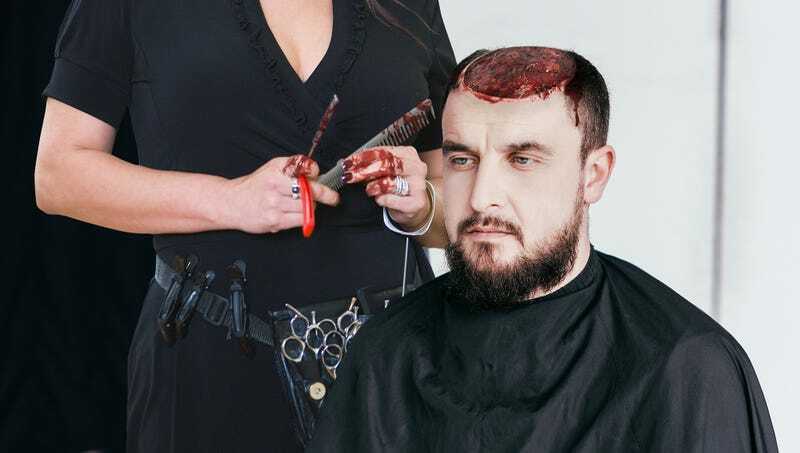 As a result, we will dismiss any employee who has left customers with nothing but a bloody skull.” Price said that, on a more positive note, Supercuts was proud to announce that instances of beheadings in their shops had been reduced to an all-time low.